Dating back to 1943, the museum was conceived after the Civil War and is dedicated to the history of the city of Barcelona. The museum focuses on the archaeological heritage of the city and spans through a large area encompassing the heritage site of the city. What sets this museum apart is that it also includes 4000 square meters of area below the square. Exhibiting various collectibles found in the archaeological excavations like the ceramics, stone, epigraphs, glass, silver and gold, marble and stone sculptures, architectural elements, organic materials and coins dating back to the Neolithic age; the museum is a great matter of interest for history lovers. Watch out for the striking Roman Busts, Roman walls with inscriptions in Roman and Hebrew. For guided and group tours, prior reservation is recommended. Various sections within the site have separate opening and closing times, visit official website for details. Closed all centers except MUHBA Casa del Guarda (Park Guell): 1 January 1 May 24 June and 25 December. 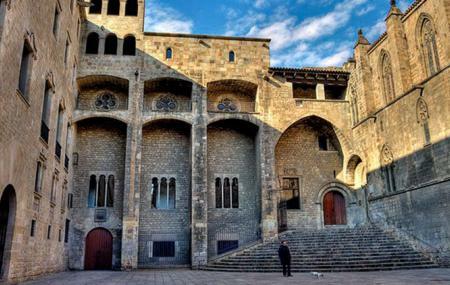 How popular is Museu D'historia De Barcelona Muhba? People normally club together Palau De La Musica Catalana and Picasso Museum while planning their visit to Museu D'historia De Barcelona Muhba. Barcelona does not do art museums well as although there are many artists of great renown from here their main pieces are elsewhere. But Barcelona does history museums amazingly well. This is my favorite. You can rush through it or meander and get lots out of it and an idea of the past of the region and space. This is amazing. You never know what's beneath your feet. Some of the audio guide runs out before you have the whole story, and doesn't quite match to where you are. Take your time and imagine what came before. This museum has a somewhat limited selection of artifacts but the excavations of the Roman ruins beneath a museum are really cool to visit. It shows that there is a whole city beneath the streets of modern Barcelona. Free access if you go there on Sundays. No where near a comprehensive history of Barcelona. Still a decent time but 80% of it was show casing the Roman walls and baths.